An annual tribute to Johann Sebastian Bach and celebration of his birthday. The competition is designed in such a way that the award winners will be announced on March 21, the birthday of the great composer. 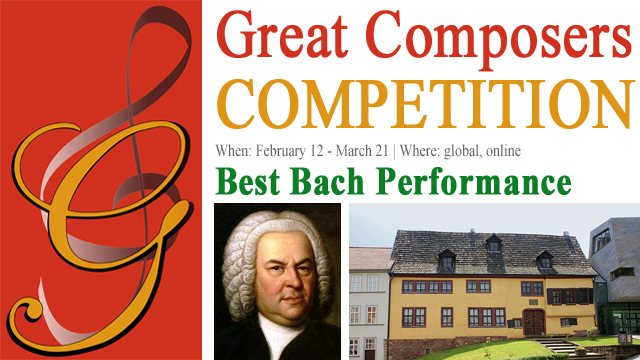 The Best Bach Performance Competition is open to instrumentalists and singers of all nationalities and countries up to 25 years. One free-choice piece by Johann Sebastian Bach. Instrumentalists: one movement for large scale works e.g. concerto or sonata. Transcriptions/adaptations/arrangements are acceptable. For example, a piece of music adapted for another instrument(s) than which it was originally composed. Singers: the performance may be "a cappella", with instrumental accompaniment, or with orchestra.